It was improved on the base of Model GKF-400 the automatic capsule of BOSH Co., Germany, under the condition of no-change for no-change for the whole construction and raised the output of single machinery increasing mould holes. 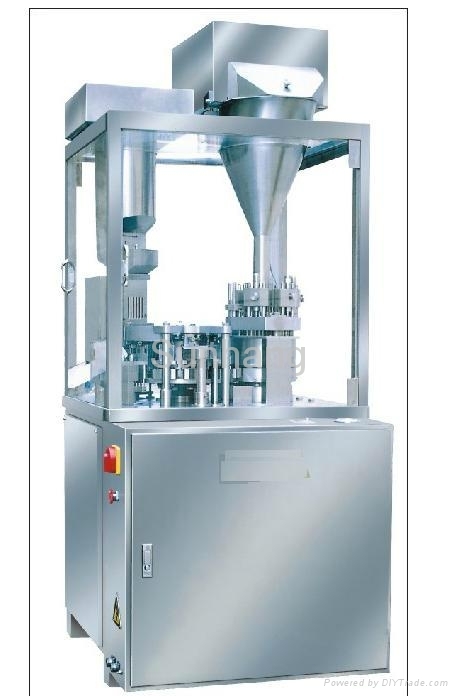 With a high speed can dividing mechanism adopt the operation of capsule distribution and separation, faulty capsules removal, medicine filling, capsule locking and its output as mold cleaning can be performed automatically. By computer control, operation is made easy and visual with speed adjustment counting and failures shown on a screen. With a porous ram-squeezing medicine filling device provided, dosing is accepted. Owing to the special mold design, the machine is well adaptable to capsules and high operation rate can be realized. Equipped with complete safety and protection devices, operation is steady and credible.